A 1st round pick (43rd overall) in the 2010 draft, Walker is one of the most prized possessions in the Mariners farm system. At 6’4 and 220 lbs, Taijuan is towering man with an imposing presence. Walker was rated last year as the #6 ranked player in all of the minor leagues. Known as a strikeout pitcher, Walker made his MLB debut August 30th, 2013 at the age of 21. Walker is renowed in the Mariners system for using the cut-fastball and a fantastic curve and has been working on a slider to add to his repitoire. 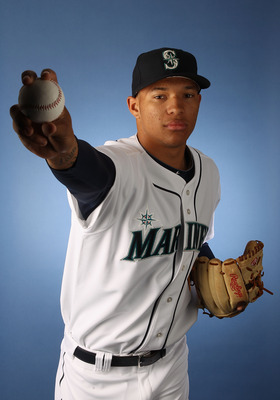 Walker is an star in the making; he is projected long-term as a solid #2 to go with Felix Heranndez. However, last year’s action was cut short by a shoulder injury. This perhaps is another case of a Mariner pitcher being rushed. Walker will begin the season in Triple A Tacoma. He will be a mid-season call-up as an injury replacement and be placed on a pitch count. Walker’s biggest fan, his mother, recently overcame breast cancer.